I think Arthur from Pouring My Art Out will be happy with the winner. 13 votes, 34%. This will go in the 2015 Calendar for May and will go into the Photo of the Year which voters will have a chance of winning the print. 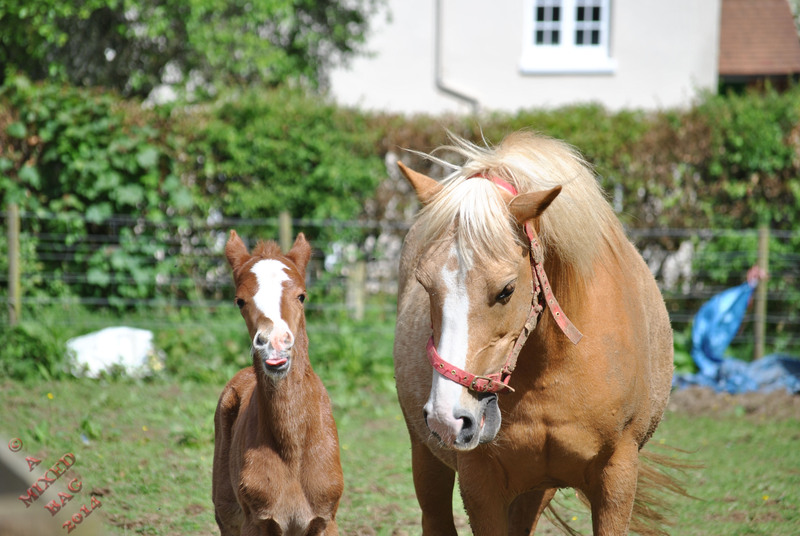 These are my sister’s horse – Sky, the Palomino, and her foal, Karma. This entry was posted in Photography and tagged Animals, Creatures, Foal, Horses, June, Karma, Life, May, Nikon, Nikon D3000, Photo of The Month, Photo of the Year 2014, Photos. Bookmark the permalink. I like the way you’ve caught the foal with tongue sticking out! You heard it from the horse’s mouth 😉 Well yesterday, I had my photo for this week, but that is now going in a post in a minute as I now have something else, and that could well be the photo of the year. After Saturday, I am sending it into my local TV station to see if they can use it for their weather photo. Oh great. Here they ask for weather photo’s and share them during the weather segments. Yay 🙂 I think it is a great image of mother and son. Sweet chicken nibblets with awesomesauce gravy! I love the horse photo! It was only two votes ahead so very close. I do like both of them though. They both show a kinship.